Sydney's new apartment market hit a brick wall in the September quarter as buyers abandoned the NSW capital for more affordable opportunities in Melbourne and Brisbane, according to property research consultancy Urbis. 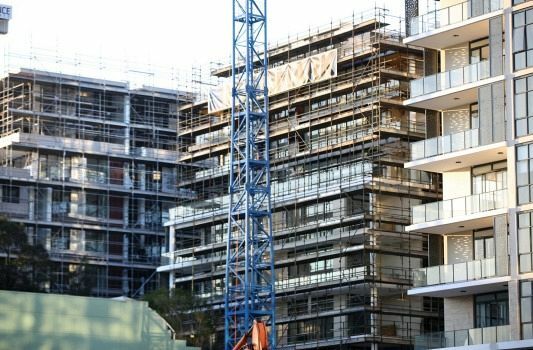 Urbis' latest Apartment Essentials report found an 88 per cent slump in Sydney off-the-plan sales over the quarter compared with the same period last year (based on a similar comparative sample of the market) with project launches down 60 per cent. By comparison both apartment sales and launches increased in Melbourne and Brisbane over the quarter with the Gold Coast also showing a strong increase in sales. "Sydney is feeling the pinch in terms of interest from buyers," said Clinton Ostwald, national director at Urbis. Mr Ostwald cautioned the latest Sydney figures were based on a smaller sample size – 13 per cent of the market compared with 16 per cent in March – which may have skewed the results somewhat, but were still "notable". Nationally, new apartment activity flatlined over the quarter "due to the weight of negative sentiment in the broader residential market" and reluctant or credit-squeezed buyers staying on the sidelines alongside an exodus of Chinese developers. But Melbourne and Brisbane fared better than Sydney because of stronger interstate migration from NSW and more affordable pricing. The Urbis figures show the weighted average sale price of an apartment in Sydney ($833,152) over the quarter was more than $200,000 higher than in Melbourne ($600,558) and nearly $100,000 higher than Brisbane ($736,065) with these markets also offering higher returns to investors. They also show that prices across the board have softened with the national weighted average sale price falling from $727,691 in the March quarter to $687,057 in the September quarter. In Sydney, the average selling price of a new apartment has fallen 24 per cent from $1.1 million six months ago. "New apartment prices have definitely softened across the board – in the order of 5-6 per cent in the last 12 months – in line with what we have seen in the capital cities," Mr Ostwald said. He added that it was also the case that developers were pricing their stock appropriately in the current softer conditions. Mr Ostwald said the primary reason for the current flat conditions was tighter lending requirements by the banks, which had started to also impact owner occupiers rather than just investors. He added that in a situation where prices are coming off their peaks, buyers tended to sit on their hands and wait a few months to see if they can get a better price. While currently a buyer's market, the slowdown in sales and project launches could lead to an undersupply in 12-18 months, Urbis said. This combined with rising rental yields could drive an uplift in activity in the future.